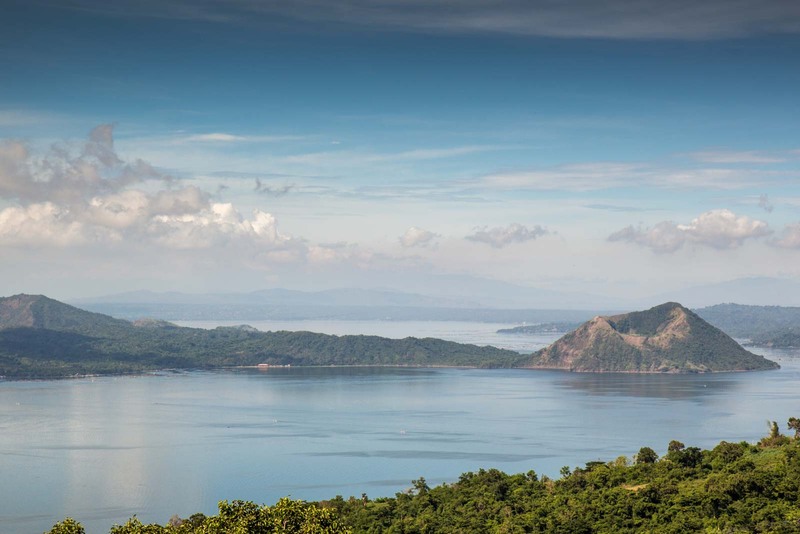 Here’s what to expect on a Taal Volcano hike and the best way to organise an incredible Taal Volcano tour from Manila. Did you know that there’s a special list of the most hazardous volcanoes in the world? There are just 16 of them on this list – from all around the world – and they have the nickname of ‘Decade Volcanoes’. So from Russia to Mexico, Spain to Japan, these potentially deadly volcanoes are given special attention because of the danger they pose to humans. They were chosen because of their history of destructive eruptions and their proximity to large populations. One of these volcanoes is called the Taal Volcano and it’s in the Philippines. Oh, and you can hike to the top! 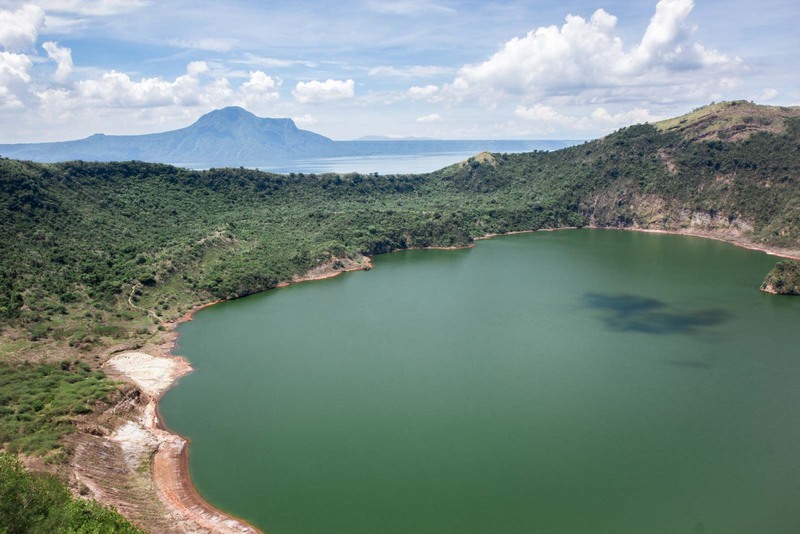 The Taal Volcano at Tagaytay is often described as ‘an island within a lake within an island within a lake’ because of its rather interesting geological formation. 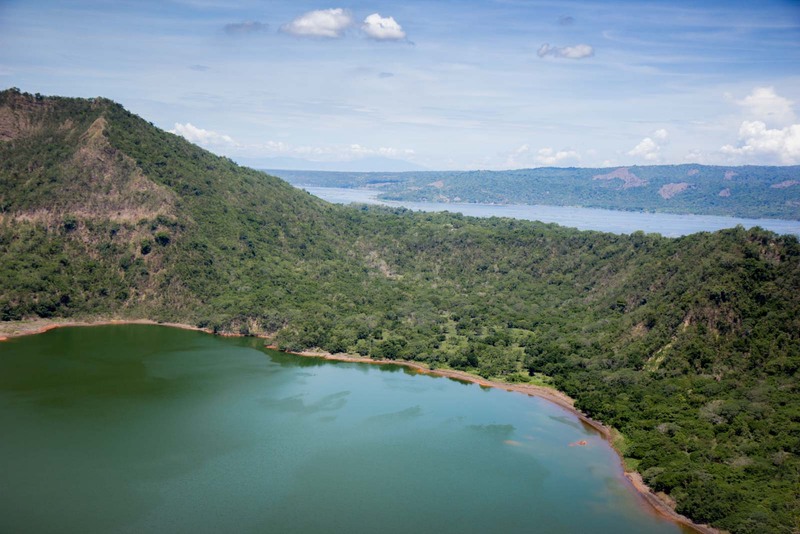 The larger of the lakes is in the Taal Caldera, which was formed by ancient eruptions. The mountain rising out of the middle of it is the active volcano. Water has collected inside its crater to form a new lake and there’s a small island popping up above the water surface. 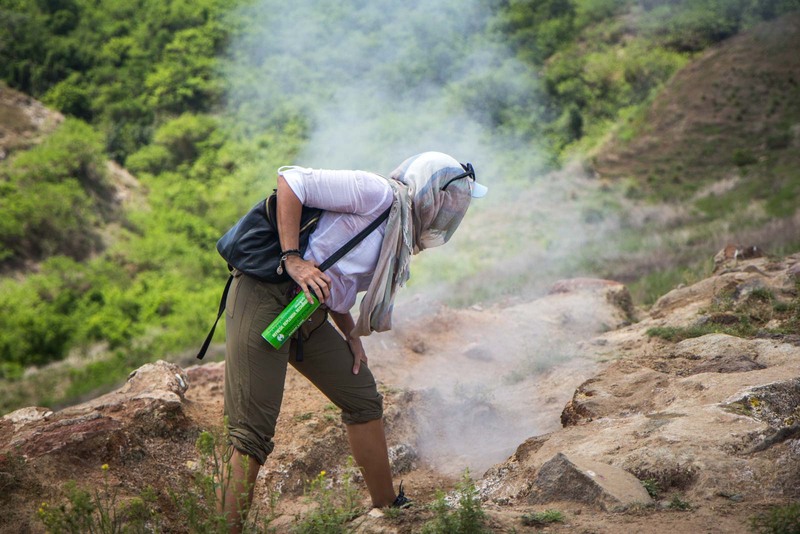 This makes the journey a little different to the way you might normally approach a volcano hike (if there is such a thing as ‘normal’ in these situations). It’s certainly nothing like the time I climbed Villarrica volcano in Chile! The first step is to take a boat across the large lake for about 20 minutes, landing on a sandy beach at the foot of the mountain. 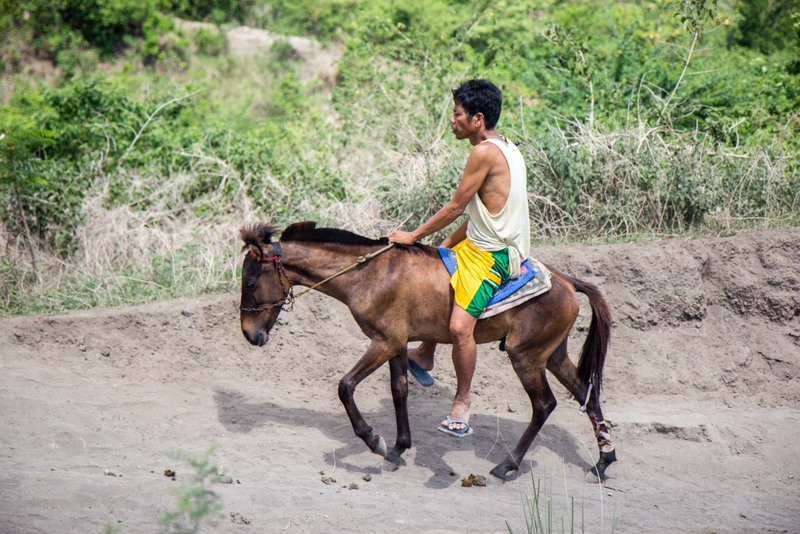 From here, the options are to either trek up the steep slope or ride a horse. 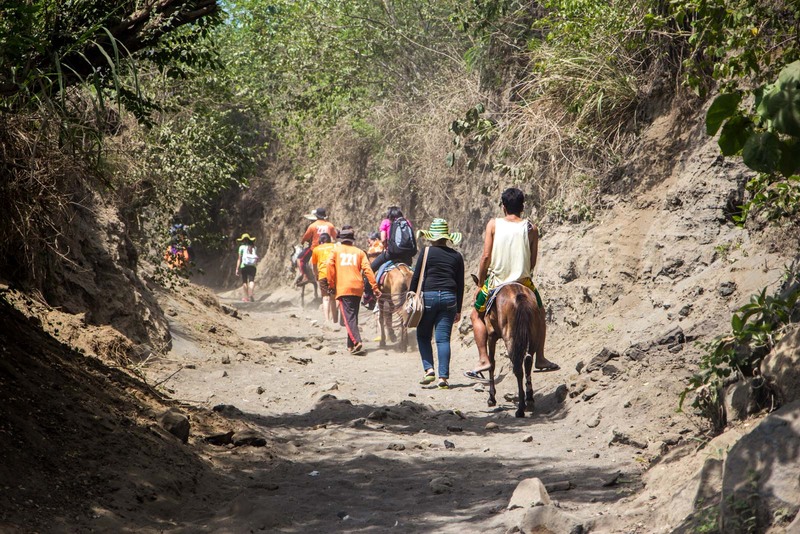 I opt for walking – partly because I quite enjoy this kind of trekking and partly because I feel sorry for the horses and am unsure of how well they’re treated. Although I don’t question the ethics of my decision, there are a few times I do curse myself. 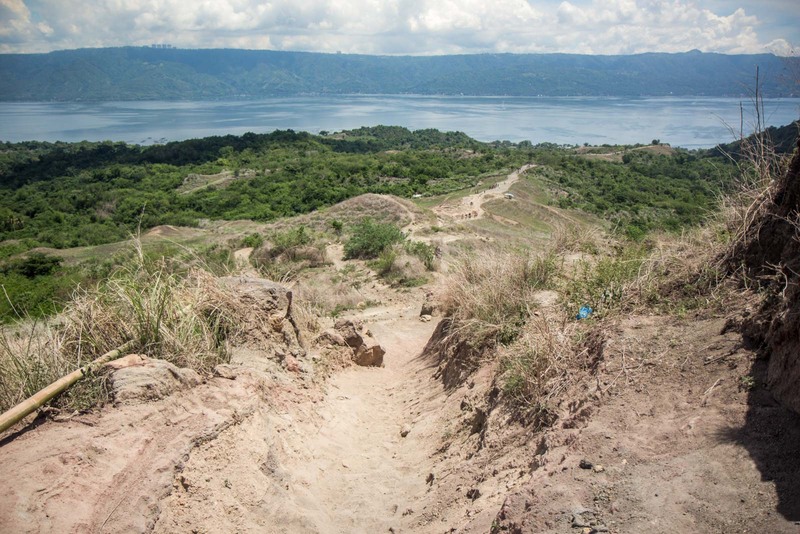 The Taal Volcano hike is long and takes at least an hour. The sun is rising higher and sweat pours from my body. There is no shade and the horses kick up dust as they race by in both directions. I feel my skin burning and my leg muscles doing the same. 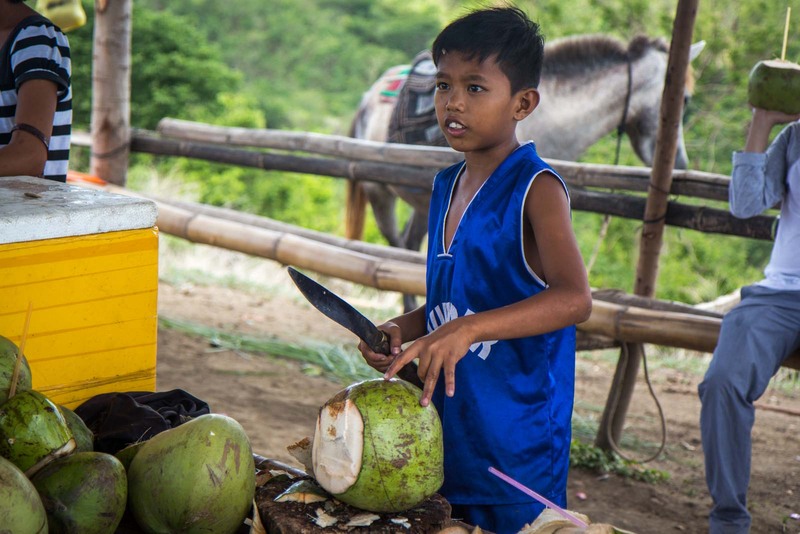 Halfway up there is a spot to have a break at a stall where a young boy chops open coconuts and sells them under the watchful eye of his father. Enterprising. And just what’s needed ahead of even more uphill. Eventually, the climb to the top comes to an end. I feel like I’ve been sunburnt and I’m desperate for a bottle of water. Thankfully there are quite a few shops here with all sorts of food and drink. This is a natural site – a potentially deadly one bubbling away with lethality – but that doesn’t mean you shouldn’t be able to buy a cold beer, apparently. Enjoying the Taal Volcano vista! Whether the visitors here choose to trek up like me or ride on the back of a horse, the main attraction is not the journey but the destination. Standing at the rim of the volcano, looking around the 360 degree panorama, the views catch you in every direction. Whether it’s back out over the lake I’ve just come, across to the other mountains and green landscapes in the far distances, or down into the centre of the Taal Volcano itself. It doesn’t look too intimidating, I have to admit. There’s no fierce bubbling or gushes of toxic-smelling gas. No lava spews forth and the ground doesn’t rumble. At one end of the viewing platforms, a Filipino man is charging tourists to hit golf balls out into the centre. With the warm sun, the beautiful views and the gathering of visitors, it’s actually quite peaceful. Perhaps that’s the most frightening thing of all. Something that appears so serene hides an enormous danger. This is nature at its geological, uncontrollable, scariest. A quiet blue lake is actually the entrance to a fiery inferno in the bowels of the earth. And it’s right beneath me. 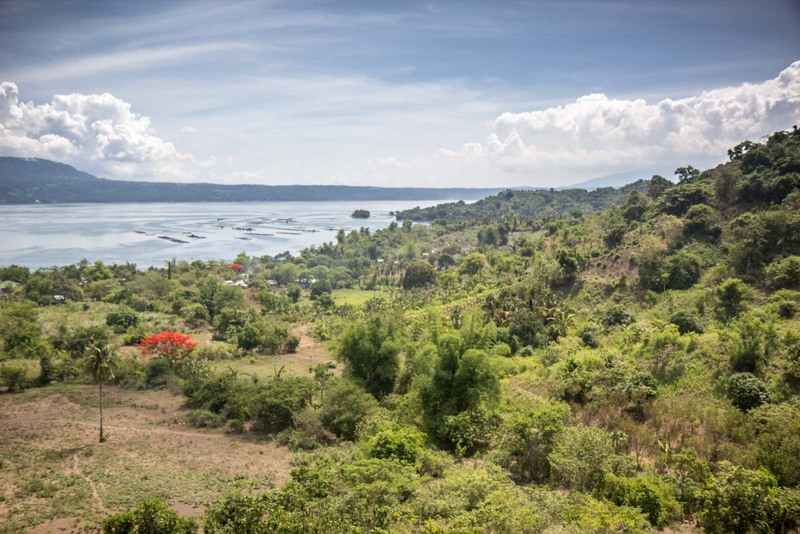 As a Decade Volcano, researchers are keeping an eye on Taal Volcano and I’m not worried there’ll be a sudden eruption – but who really knows when next it will explode and bring destruction with it. It could be coming sooner than any of us realise. Time to climb down and cross the lake to safety again. 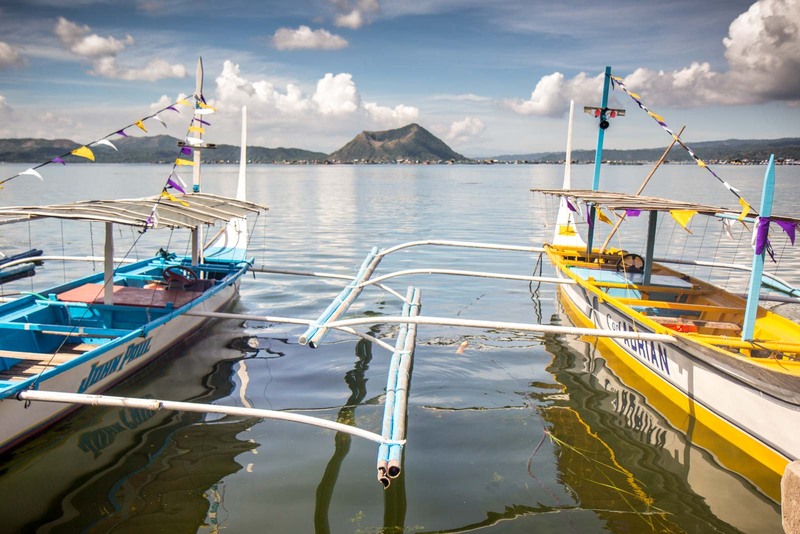 The easiest way to visit Taal Volcano is to join an organised tour. I’ve got a few suggestions here for you. Take note, though, they don’t all take you to the crater so have a look at the details to find the one that’s best for you. It is possible to organise a trip to Taal Volcano yourself but there are a few elements and it can be a bit tricky if you don’t know the area very well. From Manila, the first step is to get a bus to Tagaytay. The best ones leave from Coastal Mall or Buendia. The trip should take about 90 minutes and cost about ₱80. Get off at Tagaytay Rotunda and Olivarez Plaza. From Tagaytay, you need to get a tricycle or jeepney to Talisay. That should take about 30 minutes. At Talisay, the next step is to get a boat across the lake to the volcano. There will be plenty of people here offering their services, so you won't have any trouble finding something. You may have to do some bargaining to get a good deal. 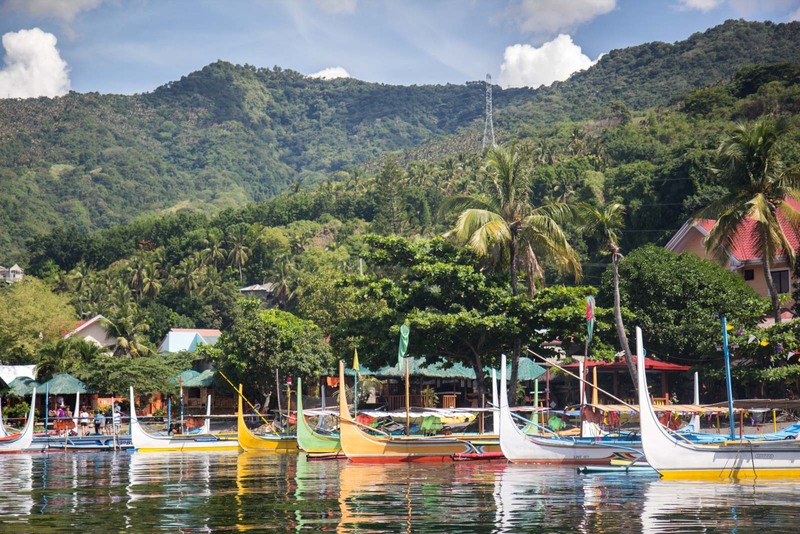 You should be aiming for about ₱2000 for a return boat trip (for up to 6 people). If you've made it this far, the good news is that means the tricky part is over. All you now have to do is hike up the volcano. The bad news is that this will be the hardest bit physically!! To get back, just do everything in reverse. As you can see, it is easier to join one of the tours, even though it will cost you more. If you’re looking for a great tour that takes you hiking up to the top of Taal Volcano, this is the one I would recommend. 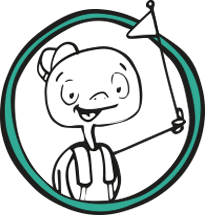 Time Travel Turtle was a guest of Expedia UK but the opinions, over-written descriptions and bad jokes are his own. Anything geological is a worthy destination! A bit of coconut on the way up sounds luscious, and it looks like the views were worth every bead of sweat. 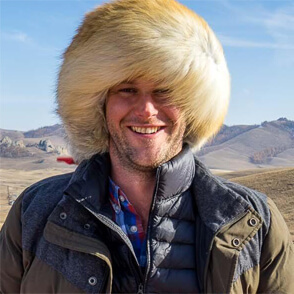 Oh, wow, I love volcanoes! That looks magnificent! Ok, so it’s missing the lava and steam and rumbling… But the shapes it’s created in the landscape are beautiful. And it’s also what you said about the knowledge of all of that power bubbling right there, so close to the surface. It’s such a reminder of the raw power of the earth and of our transience, as we gaze out over it. Or hit a few golf balls into the caldera! Looks amazing – definitely on my to-do list! Wow, even if it looks calm now, it must have certainly been an interesting experience, especially with thinking about what’s just beneath it! Sounds a fabulous experience but I agree those horses are probably not looked after well. The one in your photo looks very thin and down trodden. Do they get many tourists here? They should be able to charge a fair price, make a reasonable profit AND look after the horses fairly well. That aside, I’d love to take this journey one day. It is an exhilarating experience to be on an volcano. I’ve been on Vesuvio and White Island in New Zealand, the latter requiring a gas mask and a release form. I’ve never been to the Philippines, but this looks like a great hike! Woowww Volcano is my first love and was planning to go somewhere i can see them. Here is the place i was looking for. Great info and Clicks to describe about the place. It seems so placid that its hard to believe that disaster could strike at any moment. Makes me regret not seeing it when I had the chance, as it might not be there anymore when I head back to SE Asia! 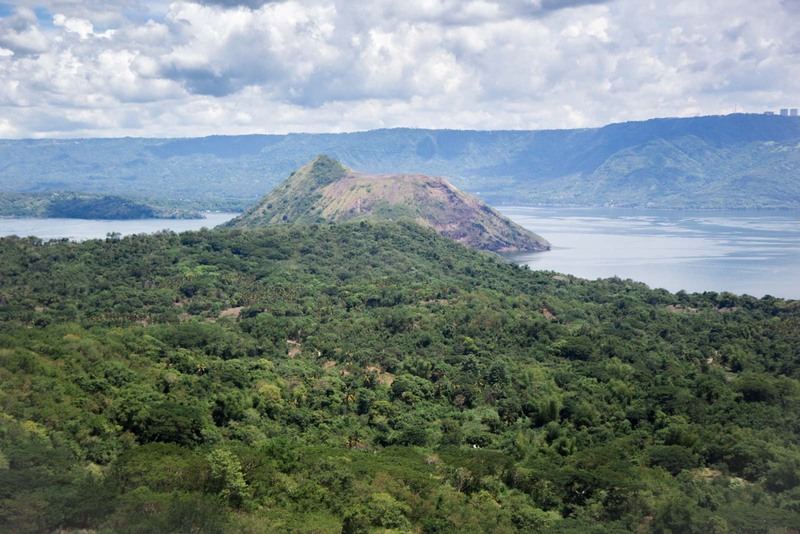 Thanks for sharing this insightful article about taal volcano. Did not know Philippines also had volcanoes. I am planning to visit Indonesia next month which has world’s most active volcanoes: Krakatau Tambora, and Merapi. Last year, I had the chance to go down the crater and take a dip at Taal Lake’s warm sulfuric waters. It was a great experience to see up close portions of the lake at boiling point and steam (that smells like rotten eggs) coming out from the searing ground. I had no idea that Taal is one of the most hazardous volcanoes in the world until now.